This is the story of of how a Persian breeder encouraged a teenager in her interest in cats, but it could just as well be the story of a person involved with any breed, and how a seed you plant today may bloom long after you are gone. This is the story of Teri's Legacy. Most fanciers have loved cats all their lives but don't become involved in the breeding and showing of felines until after they are adults, often not until their own children are grown. Some people inherit their connections, being the children of cat fanciers. They have the opportunity to enter the cat fancy early, acquiring knowledge and experience while still in their teens. I had the great good fortune to be mentored by a special woman while still in my early teenage years. Her name was Teri Calwell. 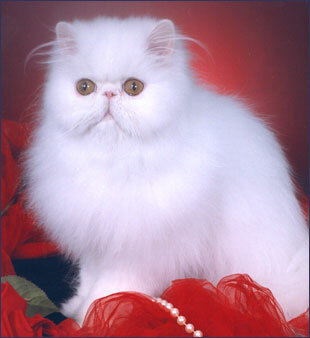 Teri lived in the Pacific Northwest and began breeding Persians under the cattery name Pazofpurity in1994. At the start of her career in cats, she mainly focused on solids. 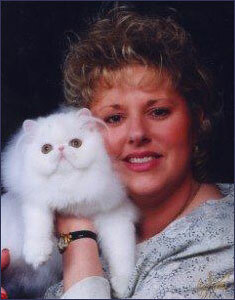 After Teri produced her first homebred grand, a Blue-Eyed White male named GC Pazofpurity Elijah Blue, Teri knew she wanted to concentrate the focus her breeding and showing program exclusively on white Persians. 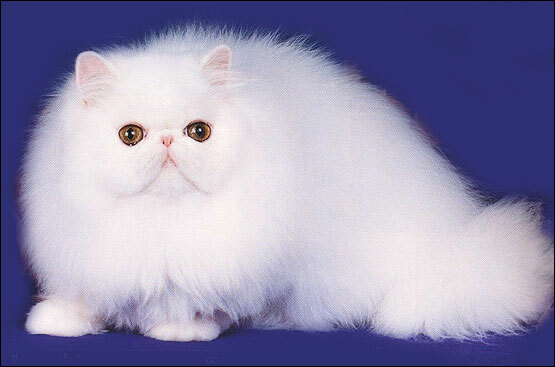 Teri went on to breed and show many winning Persians, mostly in white, but her two favorites were undoubtedly her two regional winning cats, her Copper-Eyed White female, GC, RW Pazofpurity Gethsemane and the Copper-Eyed White neuter, GC, GP, RW Pazofpurity Angel Gabriel. Teri knew all the sides of the fancy, good and bad. She was a very kind and generous person; offering tips to anyone who wanted them. She was often seen in the show hall sitting at her grooming area, helping a fellow Persian exhibitor sculpt their cats' faces. She touched many people with her generosity and helpful tips... and I certainly can count myself in that fortunate group. I first came into contact with Teri when I was in 7th grade. Teri emailed me and suggested we get together. She then made an offer that would open a new door for me. Teri volunteered to share her knowledge and expertise and teach me about cat shows, grooming, breeding and so much more that I would need to know if I were to become involved in the cat fancy. At the time, Teri was unaware that I only had a “pet” quality cat. When I learned of the great reputation and quality of cats that she had, I was sure she wouldn't want to help me with my pet quality kitty. It turned out Teri didn't care at all whether I had a top show kitten or a household pet. That was the scope of her generosity. So... she taught me how to groom my pet and prepare to show in the household pet class with the same care and devotion she would have given if I were showing a national winner. She was so much fun to be around. We would visit each other numerous times a week and talked on the phone almost every day. We traveled to several shows together - her showing her Copper-Eyed White male, CH Pazofpurity's Odds In Your Favor, in championship and me showing my HHP. The time we spent at these particular shows are memories I will never forget as long as I live. There came a time in Teri's life when she was diagnosed with bipolar disorder. It was a very difficult period for her. Yet she battled on and overcame many obstacles, whether it was in the cat fancy or in her personal life. The added challenges meant she had to cut back on her exhibiting schedule and breeding program. In May of 2006, Teri died peacefully in her sleep at her home in Eugene, Oregon. She left behind not only a loving family but also many friends from all over who miss her very much. She made an impact on me and made many friendships in the fancy. She is remembered for her bright smile, beautiful white Persians and the kind and generous person she was. Because of Teri, I have been hooked on showing since I was in middle school. 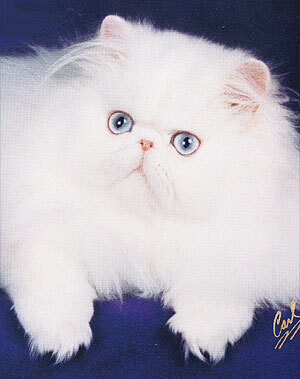 Now that I am breeding Persians under my own cattery name, I always keep Teri in the back of my mind. With everything she taught me over the years I knew her, I am trying my best to make her proud... because I know she is watching over me. 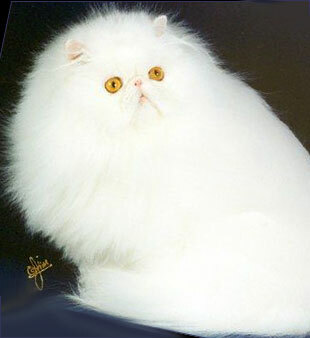 About The Author: Tashia Lyons breeds Persians under the Luvely cattery name. Originally from the Portland, Oregon area, Tashia has lived in Eugene, Oregon for some years now. 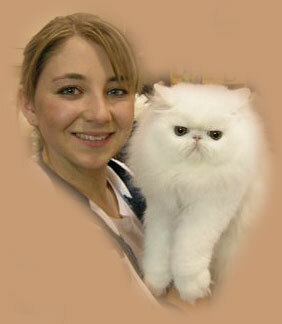 She breeds and shows solid and tabby Persians in CFA mainly in the Northwest Region (2). Tashia feels blessed to have met some really great people in the Fancy and that makes it even more enjoyable for her at the shows. In her own words... "I am very thankful for the two mentors who have shared so much with me, the late Teri Caldwell and Kathy Durdick of Ristokat Himalayans. I started off with a HHP in 2002 and now with the knowledge I have acquired, I now breed and show pedigreed Persians under my own cattery name, already having experienced success in the show ring with two Regional Winners." Tashia is pictured at right with her homebred Copper-Eyed White male, Luvely Ice Ice Baby.